Today you’re up early to get started on a day that you’ll long remember. Travelling on one of the longest roads in Australia, the Stuart Highway, also known to locals as ‘the Track’, you’ll see some of the most amazing terrain this country has to offer. When we turn onto the Arnhem Highway, the Marrakai Plains will provide a beautiful backdrop for your onward journey. Covering an area of more than 19,800 square kilometres, World Heritage listed Kakadu is the largest National Park in Australia. The combination of mangrove fringed coastal areas, expansive flood plains, lowland hills, open woodland and forest habitats make Kakadu one of the most diverse landscapes you’ll ever experience. Be amazed at the population of wildlife in the water, on the land and in the air – Kakadu is home to a myriad of animals, hundreds of bird species and thousands of different insects and plants. Marvel at the concentration of rock art sites that illustrates Aboriginal culture found at Kakadu, some dating back 50,000 years. Be mesmerised as you wander the Nourlangie Rock Art Site. It has provided shelter to the indigenous people for many thousands of years – and while taking shelter, the rock evolved into a canvas that illustrates their very deep spiritual culture. The 1.5km walk around the base of the rock, led by your Driver Guide, will give you the opportunity to see many different forms of Aboriginal rock art paintings. 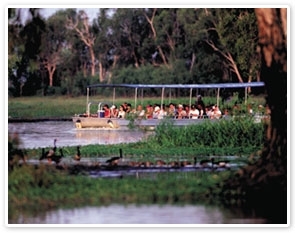 After lunch you’ll join your Local Guide for a cruise on the Yellow Water Billabong, Kakadu’s most famous wetland. 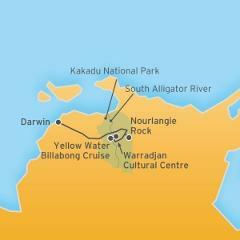 The picturesque yellow waters are home to thousands of saltwater crocodiles and up to 60 species of colourful birdlife. The Bininj people are the traditional custodians of Kakadu National Park and now we visit the Warradjan Aboriginal Cultural Centre to introduce you to their way of life.